Here is another instance where I would LOVE to take credit for this recipe, but I cannot. I stopped by a local orchard and picked up some fresh blueberries. Alongside of various produce items, there were recipes. I asked if it was okay to take a picture of the recipe, and the clerk told me I could just take one. They were printed and in tablet form so you could just tear one off and take it with you. I thought that was a very cool idea. So, I will share this recipe with the disclaimer, “this is NOT a low-calorie or low-fat food”. That being said, it was oh-so-good!!! Here is the recipe. Happy Independence Day!!! Have a fun and safe weekend! There are some very good prepared potato salads at delis and grocery stores, but generally I do not like the consistency of the potatoes. They can be under cooked or just flat-out mushy. With that in mind, I decided to try my hand at homemade potato salad. The result was so creamy and luscious, I may never eat store-bought potato salad again. And, I got husband approval! 1. Boil potatoes in salted water until just tender. (Do not over cook or you will have mashed potatoes instead). Drain and rinse the cooked potatoes with cold water to stop the cooking process. Drain well. 2. Mix remaining ingredients in a mixing bowl. 3. Add cooked potatoes and gently toss. 4. Refrigerate for at least an hour before serving. Makes about 4 servings. You can double the recipe if you are having more guests. *If you don’t have fresh parsley on hand, you can use dried parsley. I found a wonderful brand of freeze dried herbs made by Litehouse, which are very flavorful compared to other brands. **Most grocery stores sell containers of pre-cut veggies in the produce section, but you can use about 1/4 onion diced and 1-2 ribs of celery diced instead. At least for me, noodles are pure comfort food. Add some Asian flavors and you cannot go wrong. This recipe was given to me by a coworker. The recipe calls for a pound of noodles, but I usually halve the recipe for just me and my husband. 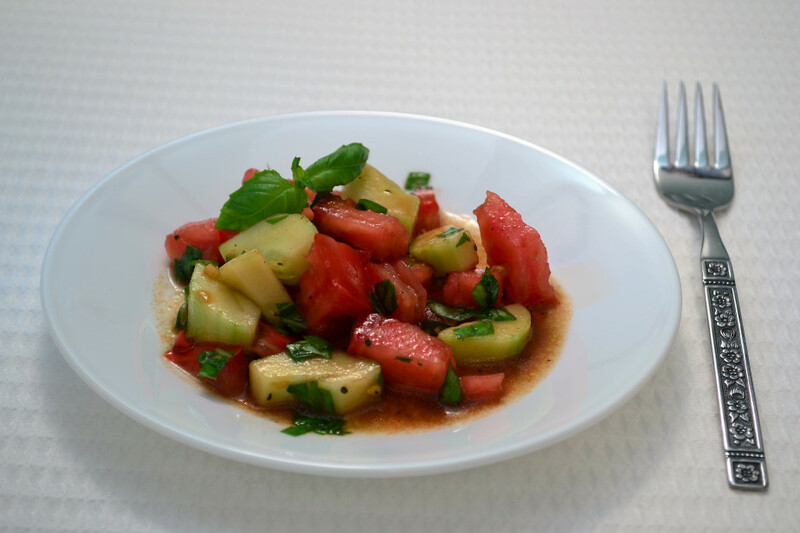 This is an easy and quick recipe that is perfect for bringing to a casual picnic or party. It is intended to be served slightly cool or at room temperature, but is just as good served warm. 1. Cook pasta according to package directions, adding the carrots to the water so they cook with the pasta. Do not over cook noodles. Drain and rinse with cold water. 2. In a mixing bowl, mix the soy sauce, olive oil, sesame oil, sugar, ginger, vinegar and pepper flakes. 3. Toss noodles in the dressing mixture and add toasted sesame seeds. 4. Sprinkle with diced scallions (green onion) for garnish. 5. Serve warm or chilled. *To toast the sesame seeds, the recipe calls for baking at ~325 degrees for about 2-4 minutes. I prefer to put the seeds in a dry frying pan at low-med heat. You need to pay attention though, because they will burn quickly. Stir the seeds until they are a nice light brown and then transfer them to a paper plate until you are ready to use. I wish I could say I made this from scratch, but that would only be a half truth. The cake is from a box with pudding in the recipe, very moist. The icing is adapted from a recipe in a, appropriately named, cupcake recipe book. This recipe came directly from a sticker on the squash, although I didn’t use all the ingredients they recommended. 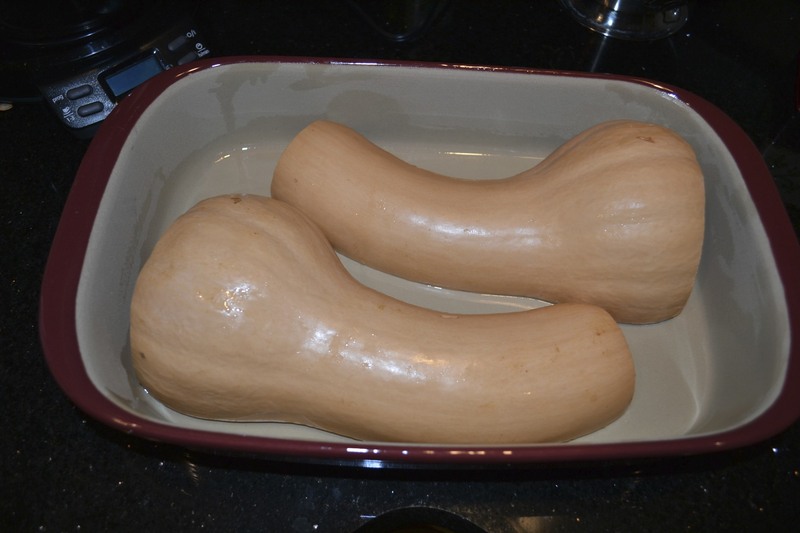 Their instructions were to preheat the oven to 400 degrees, cut the squash in half lengthwise. Remove seeds, then bake cut-side down in a shallow pan. Test with fork. Remove and sprinkle with salt and brown sugar, then bake until golden brown. 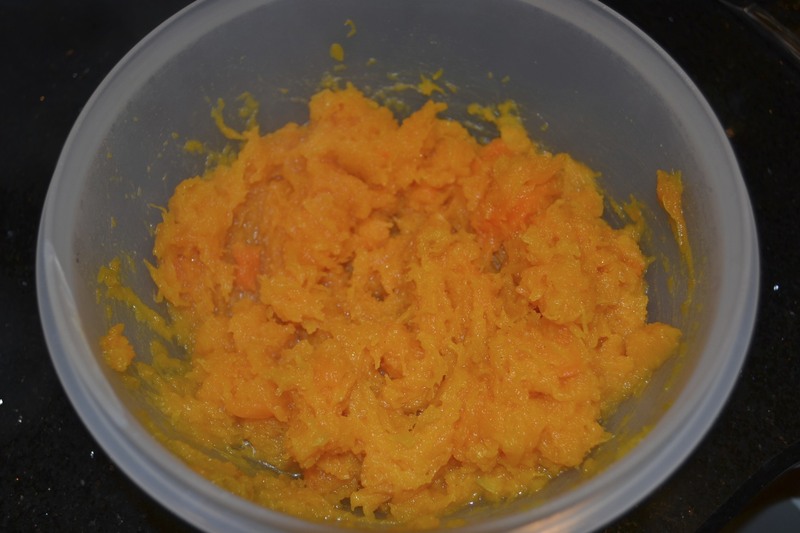 They suggest that the squash can be mashed, drizzled with butter, honey or syrup. ~From Stauffer Huling Farms. I personally think that the squash is sweet enough on its own and does not need any more sweeteners or calories. I kept it real simple. 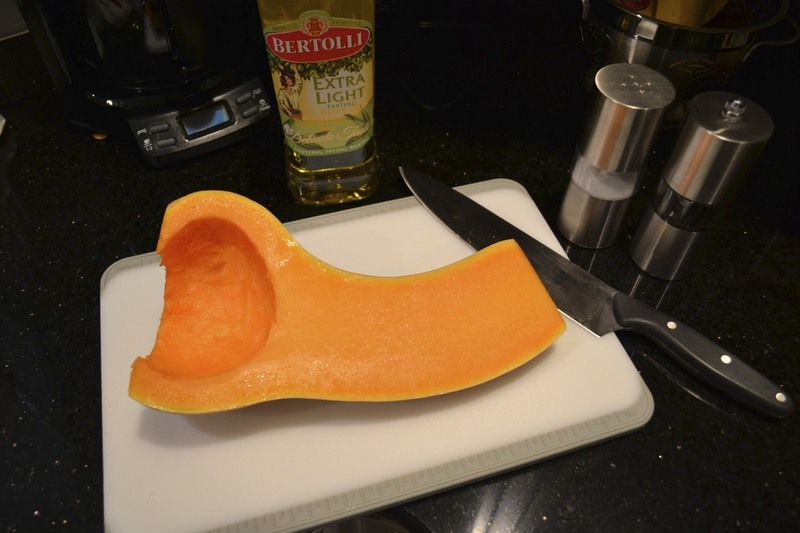 The hardest part of this recipe, for me, is cutting the squash, as it is very hard-skinned. I used a large chef’s knife, but you need to be careful. I guess that is the mother in me talking… I put the Olive oil on the bottom of a large baking pan. For this recipe, I used the Pampered Chef stone pan. 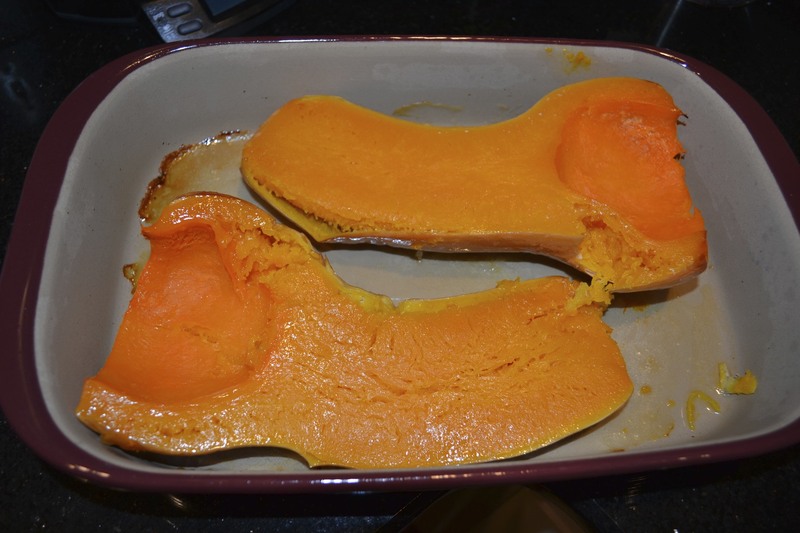 I then placed the squash cut side down in the pan. I baked it at 400 degrees for about 35 minutes, and it seemed to be cooking a little too fast, so I turned the oven down to 360 degrees and baked it for about 15 minutes more. This is what it looked like when it was done. I scooped out the squash from the skin, and placed it in a mixing bowl. I added the butter, salt, and pepper and lightly mashed it. My husband said it tasted like sweet potatoes. Go ahead and add the sweetener if you like, but I think it is good just the way nature made it.